Dr. Robert Wuthnow joined us as the inaugural Thomas H. Lake Lecturer September 25, 2003. His lecture was entitled "Faith and Giving: From Christian Charity to Spiritual Practice." In it, Dr. Wuthnow shared results of his research, discussed changes in faith and giving over times and their impact on society, and explored current issues. 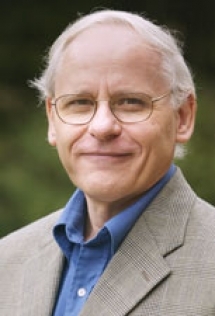 Robert Wuthnow is director of the Center for the Study of Religion at Princeton University, which aims to encourage scholarly research, teaching, and public discussion about religion through the diverse perspectives of the humanities and social sciences. He teaches sociology of religion and cultural sociology, specializing in the use of both quantitative and qualitative (historical and ethnographic) research methods. Dr. Wuthnow is an internationally renowned scholar in religion and contemporary culture. His books include God and Mammon in America, Growing Up Religious: Christians and Jews and Their Journeys of Faith, and Acts of Compassion: Caring for Others and Helping Ourselves, for which he received a Pulitzer Prize nomination. Through a Guggenheim Fellowship, he is writing a book on the new challenges of religious and cultural pluralism.